This is a day that requires you to play hooky from whatever else you are supposed to be doing! Your presence is requested at Bear Patch! 20 is that magic number signaling another anniversary gift from us to you! This month, we have called on the resources of a very talented local designer--Gudrun Erla! You might already know Gudrun and her company, GE Designs. She designs quilt patterns and fabric, too. And lately, she has been busy designing rulers through Creative Grids Rulers. Her Stripology and Stripology Squared Rulers have been big hits with many quilters, and she has a full range of books and patterns to support those rulers. In addition to that support, she has another product - GEasy Ruler Stickers - which come in oh-so-handy on my cutting table! I did write a product review on this blog last May, which you can refer to if you would like to see how I make use of the Ruler Stickers. But better yet, watch this video to help you understand why you really need these stickers! For our anniversary celebration, Gudrun has packaged single sheets of stickers for us to give away! You will receive 64 colored arrow stickers just for being our very best customers! They will be 1 of the 3 colors in her usual package, and if you want the full assortment they will be available to purchase. No purchase necessary, available 1 per customer while supply lasts. I promise it will be worth the drive, unless you're coming from Alaska! Or depending on your thinking, it might even be worth that drive just for the fun of it! I think if I look real hard at the horizon, I can just barely see a convoy of quilters speeding southeast to Bear Patch! It's a medallion style quilt, and incorporates the Bear Paw block that is part of our store logo. 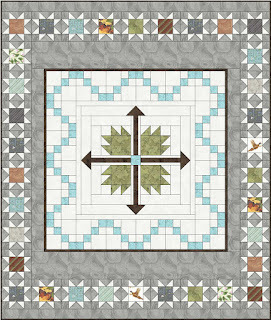 Medallion quilts are based on some type of center square, then bordered on all 4 sides. 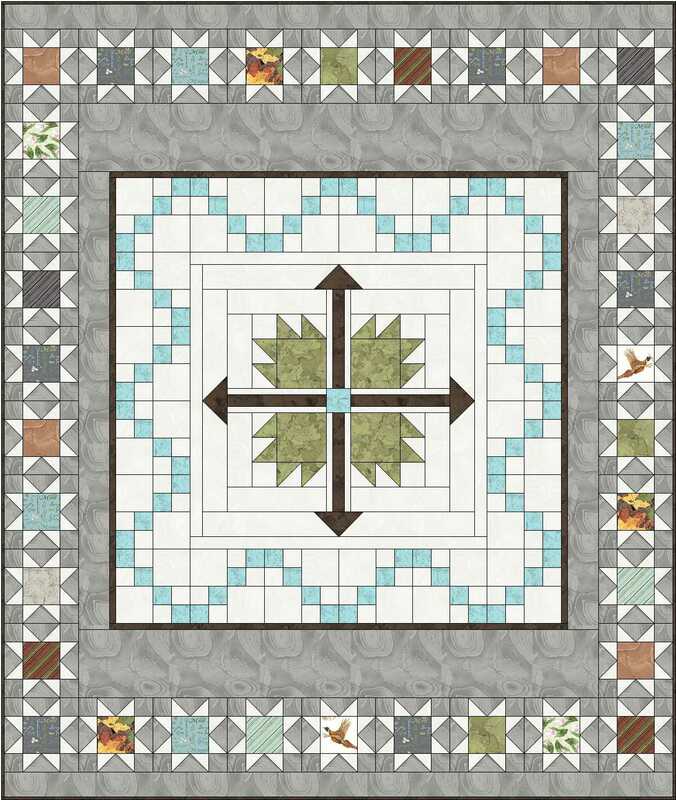 I know that a lot of quilters would much prefer to make a rectangular quilt than a square one, so I have added some inches on the top and bottom sides to make it "un-square", yet keeping the look of the medallion. It measures 54" x 64". If you really want to make it square, it would be easy to modify, and I will probably include something about that in the directions. I quilt on an A-1 Elite machine purchased 10 years ago. It is all hand-guided, no computer attached, just me! It does have a stitch regulator, which I always use. I have a 14' table, so can do up to about 150" wide quilt. Probably more like 140" to allow for enough room to have the backing and batting extend a bit beyond the quilt top edges. I like to have 5" all around for better freedom of movement. I use an extended base on my machine whenever I need to use rulers, and if I don't have that 5" cushion, the base bumps into the clamps for the sides. That makes a nasty little bobble in the stitching. I also do free-hand without that base, as well as some pantograms. I haven't been using my longarm much during the past 2 years, before that I did quilt for customers, but I found that I was taking on way too much. Having too much on my plate does not make me a happy quilter! The thread I use is a real hodge-podge of what color and weight works best. The blue thread in the video is actually Isacord (by OESD) and is normally used for machine embroidery. It's lightweight, yet sturdy enough to run on this type of machine. I used another thread, usually cotton, on the bobbin. For most of the rest of this quilt, I used King Tut, Sew Fine and Omni (Superior Threads). I never really keep track of the time I put into quilting something like this. I never can work for long periods, needing to stop for a break often and then spending time thinking over what design I'm going to do next! And my neck and shoulders ache when I overdo it, so that doesn't help. It's just not something that I can dedicate more than about 2 hours at a time to.